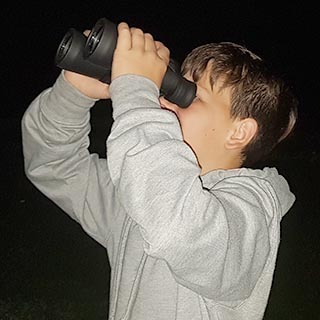 Binoculars are an excellent way to get started in amateur astronomy, arguably better than a telescope. Binoculars are also useful for experienced astronomers—you don't need to worry about outgrowing them. If you don't think binoculars would be much use for stargazing, or if you think they're just an option for people who can't afford a telescope, think again. I actually recommend that budding astronomers begin with binoculars. Later, if you're still keen, buy a telescope and keep the binoculars. Most seasoned astronomers use binoculars at least some of the time. As long as you buy a decent pair, you'll probably use them regularly for the rest of your life. As you can see, I'm a fan of using binoculars for astronomy! Cheaper than telescopes (unless you're talking about high-end specialist binoculars). Small, light, portable with virtually no set-up required. Robust and will usually last a lifetime (at least). Comfortable to view, and you can use both eyes which has several advantages. Wide field of view. Although you can't see the details that you can with a telescope, you can see more of the sky at once. This makes them ideal for learning the sky. The image is the right way up (most telescopes flip the image which can be confusing). Can also be used for land-based viewing. Other than the Moon, you can't really see details of individual objects with binoculars. For that you need a telescope. Hand-held binoculars are shaky, although you can stabilize the view somewhat by leaning against something or using a tripod. Of course telescopes also need to be mounted on something, so technically it's not really a "disadvantage" of binoculars—it's just that the "advantage" of being able to hold them in your hands isn't as much of an advantage as you might think. Note: You might also want to have a look at gour general introduction to stargazing.